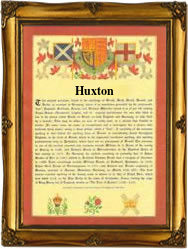 This interesting surname of English origin is a dialectal variant of the locational name Hoxton, Middlesex, deriving from the Old English pre 7th Century personal name "Hoc" plus "tun" meaning "farm, settlement", hence "Hoc's tun". The placename is recorded as Hochestone in the Domesday Book of 1086, as Hocston in the Feet of Fines of 1221, and as Hoxtone in the Valuation of Norwich of 1254. The surname dates back to the late 16th Century, (see below). Church recordings include one Margerie Huxton who married William Colburne on October 22nd 1618, in Childerditch, Essex, William Huxton married Ellen Barton on October 1st 1798 in Wigan, Lancashire, and Elizabeth Joanna Huxton married Benjamin Thomas Bokin on May 1854 at St. Dunstan's, Stepney. One William Huxton married Mary MacLacklan on July 17th 1864 in Deptford, Kent. The first recorded spelling of the family name is shown to be that of Rainold Hoxton witnessed the christening of his daughter Ann, which was dated 1597, St. Mary, Whitechapel, Stepney, during the reign of Queen Elizabeth 1, "Good Queen Bess", 1558 - 1603. Surnames became necessary when governments introduced personal taxation. In England this was known as Poll Tax. Throughout the centuries, surnames in every country have continued to "develop" often leading to astonishing variants of the original spelling.